Last month I wrote about sitting with discomfort. Earlier this month 8 Limbs Director Anne Phyfe Palmer wrote about taking space. Today I want to talk about a connection between discomfort, space and yoga, and share a few practice resources. Most of us understand life doesn’t always feel comfortable. By the time we’re adults we’ve usually had plenty of opportunity to experience growth that arises from discomfort. Conditioning, though, often leads us to believe that in the midst of discomfort, we should resolve it. This conditioning can land us on a slippery slope. Spaciousness may feel dreamy in the heat of a hot mess; it may essentially feel “right” when life feels utterly wrong. Yoga can take on a similar glow. It can feel good in body to move through an asana practice. As such, it might feel significantly more “right” than the crappy feeling we experienced just before class. This is where the slope can slip — if we conflate relief, practice, and resourcing ourselves… with an evaluation. If we judge comfortable as better (or more correct) than uncomfortable (rather than just noticing what’s pleasant and unpleasant). When we practice in order to get to that inherently pleasant ideal of “right”, we risk checking out. As Anne Phyfe highlighted, it can be skillful to make space and dig into our practices in order to navigate life’s complexities with care. And it might feel good (or better) as we do — that’s okay. Similarly, asana can feel good — nothing wrong with that. 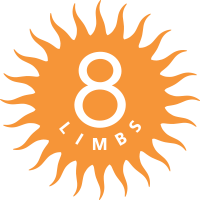 At 8 Limbs, though, we have to keep reminding ourselves that feeling good (i.e., experiencing comfort, pleasant…) is a potential effect of yoga — but not its aim, and not “getting it right”. At the heart of yoga is a call for connection. It’s a path for checking in and being with, throughout the full spectrum of comfort-to-discomfort. Take a few moments to rest awareness with your natural breathing rhythm, abiding with sensations of inhalations and exhalations. Expand awareness to feel any spaces at the top of inhales or bottom of exhales, even if they are just micro-spaces. Explore an attitude of curiosity as breath continues. Soften your gaze or close your eyes all together and attune to ambient sounds. Might you let go of the source of sounds, exploring an attitude of wonder? Might you also not seek out sounds, but rather allow sounds to naturally meet you and dissipate on their own? After a few moments expand awareness to include spaces between sounds. Is it possible to sense into silence? Check out travel writer Pico Iyer’s The Art of Stillness, available as a TedTalk and book. He makes a wonderful case for doing nothing from time-to-time in order to make more meaning out of the rest of our lives. Feel free to share with me the ways you make space to respond, grow and check-in at ashley@8limbsyoga.com. * Although often attributed to Viktor Frankl, scholars believe he did not author it. However, many believe this quote depicts an accurate paraphrasing of Frankl and his ideas.